Single line slots are the most basic type of slot machines. These are the classics that were first introduced to the American public by Charles Fey back in the late 1800s. Over a hundred years later, three reel slots still have a place in every casino around the world. 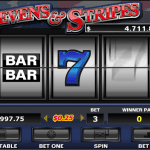 If you have an affinity for traditional slot machines, allow me to recommend a few slots casino sites that are known for their extensive selection of single line games. You’ll never have a hard time finding a place to play single line slots online. Every casino on the planet has at least a few. Most gambling sites have dozens of them available at a wide range of stakes with a whole variety of themes, payout tables and jackpots. My process in choosing the above sites to recommend was to consider the variety of single line slots, payback percentages and reputation of each casino. Looking at each factor and eliminating sites one by one left me with a short list of gambling sites that I know and trust. Variety: Single line slots are found everywhere, but some casinos sites offer much more variety than others. A site that offers just a few single line slots is fine, but it’s better to have options. The best sites have an assortment of pay tables that emphasize either smaller, frequent wins or larger, less-frequent wins. Payback Percentages: One of the most informative measures of a slot machine is its payback percentage. 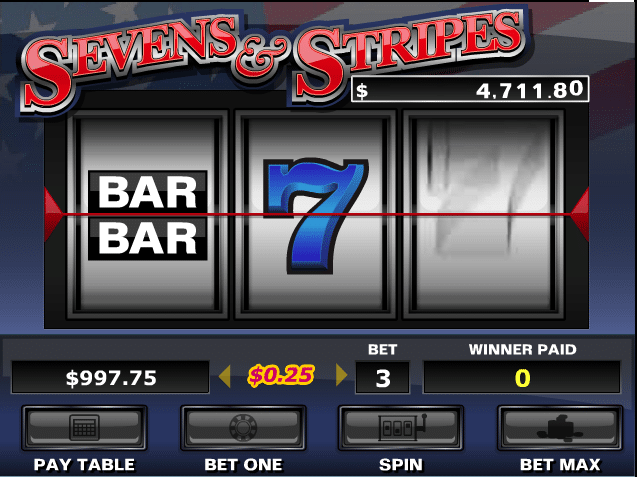 This number tells you how much money the slot returns on average for every dollar wagered. For example, a payback percentage of 97% tells you that for every $100 wagered at that machine, an average $97 is returned to players in the form of payouts. Reputation of Each Casino: Reputation is an important thing to consider in any discussion of real money gambling. No matter what your favorite game may be, it is vital that you only play at casinos that have reputations for paying winners quickly and hosting fair games. Think of the most old-fashioned slot machine you’ve ever seen. The odds are it was a single line machine, also known as the “one-armed bandit.” These are the machines that have three reels, one payline and a lever on the side that you pull to activate the machine. Today’s online slots work in the same basic manner except now you push a button instead of pull a lever. But first, you choose how much you want to wager on each spin of the reels. At most machines, you can wager anywhere from 1 to 3 coins and can set the denomination of each coin to any number you feel comfortable wagering. If you want to keep your risk low, you could wager a single coin at a denomination of $1. This would result in each spin costing a grand total of $1.00. Alternatively, you could bump up the number of coins, the denomination or both. For example, you could choose to wager 3 coins worth $2.00 each. Each spin in that case would cost $6.00. Anyways, you choose how much you want to bet and then spin the reels. The three reels will spin around and around and then slowly come to a stop. You win a payout if three winning symbols show up in a line right in the middle of the slot. These are called “single line” slots because there’s only one winning payline – the line that runs horizontally across all three reels. More complex slot machines have multiple paylines that run horizontally, diagonally and zig-zag across the front. Some single line slots come in a variety of flavors but you can generally categorize them into standard jackpot and progressive jackpot slots. Standard jackpots offer fixed payouts that don’t change over time. You can look at the pay table and know exactly how much each combination of winning symbols will pay. Progressive jackpot machines have normal fixed jackpots as well, but they also have a much larger jackpot that grows over time. A portion of every dollar wagered at a progressive jackpot machine is added to the ever-growing prize pool. In many cases, hundreds of machines are all linked to the same jackpot. Progressive slots are home to the biggest jackpots in all of gambling. They rarely hit, but when they do hit, it’s for an incredible amount of money. Follow casino news for a while and you’ll occasionally hear about the lucky gambler who has won several million dollars after hitting the big one. Why play single line slots? Single line slots are easy to understand. I cannot emphasize this enough, but single line slots just make so much more sense. Some multi-line slots are so complex that it’s almost impossible to even figure out what’s going on. If a complex multi-line slot was failing to pay half the time, most people would have no idea. Take a look at any multi-line video slot and you’ll see what I mean. It takes a fair amount of squinting at the pay table and flicking back and forth between various help pages before you’ve got even a modicum of understanding. In some instances, I’ve found myself blindly wagering at a multi-line machine without really having an idea of what was going on. Single line slots, on the other hand, are simple. You’ve got one payline that runs right across the center of the machine. Get three like symbols and win a payout. There’s no question of what’s going on. You’re not sitting there hoping to hit all kinds of crazy zig-zag paylines and going through all kinds of bonus rounds, side games and other nonsense just to get paid. I don’t say this to degrade multi-line games, but this is why some people stick with single-line slots sites. Sure, multi-line video formats have their charm. There’s nothing wrong with them at all. But if you want to make sure you’re fully aware of what’s going on at all times, single line slots are definitely the way to go.